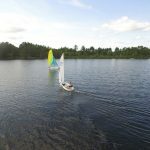 North Star’s waterfront would not be complete without our fleet of sailboats. 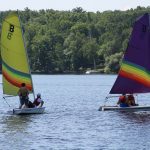 Sailing truly exemplifies our objective based programming as campers are able to progress through the various levels of sailing and learn how to sail on our different boats. 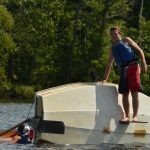 As beginners, campers will learn the essential basics, how to tie knots, rig and de-rig boats and care for equipment. 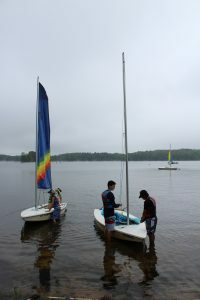 They gain the hands on experience that has them sailing in no time. 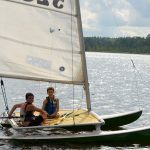 We teach and sail on a variety of boats. 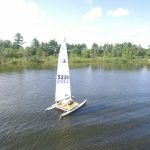 Our four Barnettes and four mini-skows are smaller boats that allow campers to sail either by themselves or with one other. 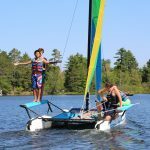 Our two X-boats are larger, four person boats and allow campers to sail with larger groups. Most recently, we added two Laser 420’s. 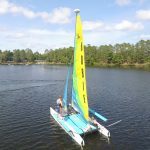 More experienced sailors use one of our Catamarans, a favorite on the program.